Super Sprouter® Root Raft® replacement plugs make reloading your Root Raft® simple. Just clean your existing tray and insert, refill the floating insert tray, add water to your 10 x 20 inch tray and your good to grow. 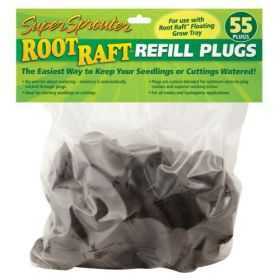 These plugs are specially sized for the Root Raft® Floating Plug Tray. They are custom blended and custom sized grow plugs. Mother Earth® BioChar added to this exclusive formulation.